TED talk | "Hey, Mitz!" (Wha…? TED? lol… Then, I stopped. Hmm, I thought, maybe…I guess it’s possible). “You have a point,” I said, “TED is in my future.” And I briefly rambled – Couldn’t I do all that booking and linking on my Blog site…? Vulnerability. Julia also told me about incredible TED talks by researcher, Brene Brown. Vulnerability and Shame are amazing. And after watching Brene and hearing her message, it got me thinking how us athletes and coaches have such a hard heel dug into “don’t be vulnerable” and “never be weak,” because, hey, it’s sports and you have to be tough and tougher to fight hard and win, never be weak, never give up, just go, go, go. Got it? But at times, athletes are vulnerable. Don’t fight it. That’s when you are most brave and connect with others. If you suppress emotion too much, you create obstacles and inner stress. It is suppression that stops us, keeps us disconnected, untrustworthy, and even powerless. In human nature, it’s our core desire to express – shout when you’re happy, cry when you’re sad. Right? So we need to connect. Through personal exposure and shared empathy, you can become a vessel of truth and power. If you struggle while avoiding vulnerability, you are only defeating yourself. You are not perfect. No one is. And it’s all a *big show* if you always fake it (faker faker). So think: You can’t know or learn about your teammates OR yourself if you keep faking, always hiding your pain. It’s not real. And the best athletes in the world, like Venus Williams, who are tough, face challenges, yet openly share vulnerabilities – THEY ARE REAL AND BRAVE – and that’s why we want to be like them. So Talk. You don’t have to do a TED talk. Just talk to your mom, dad, sister, brother, friend. What are you feeling, thinking? Maybe, just maybe, your coach or teammates will understand. Maybe they will help you. Maybe, a teammate will say, “Yeah, me, too.” But I guarantee, you will feel brave to speak honestly and relieved to open up. And, you will find others who feel the same way. In becoming vulnerable with your teammates, you will automatically start to lean on one other, then support each other, and push each other to overcome the toughest moments. Through all of this you will become closer. Together you will feel powerful, and possibly, invincible, and when you do, you will rise and soar higher and higher, reaching the most amazing heights–together. And that, my friend, is the power in sports. Now, back to writing. TED may be calling. 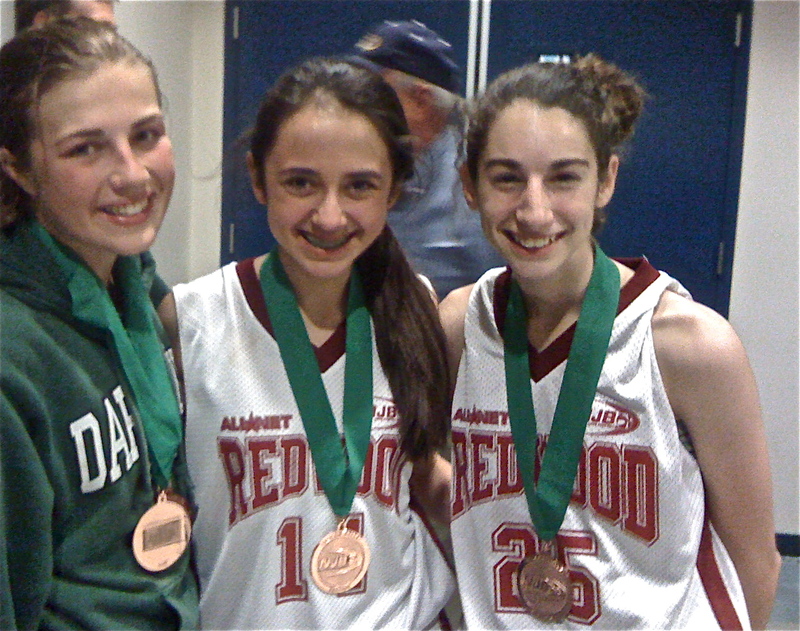 Hannah, Annalisa, and my daughter, McKenna winning Regional Basketball Championship. The girls talked, became a close team, and went on to win the National title.